Bill and his roundtable guests - Steve Ballmer, S.E. Cupp, Mark Leibovich & Richard Clarke - will answer viewer questions after Friday's show. Jack Bryan is the Director, Co-Writer, and Co-Producer of the documentary "Active Measures," which chronicles Russian efforts to influence the 2016 U.S. presidential election. The film is now in theaters and on iTunes. Bill and his roundtable guests – Kara Swisher, Rick Wilson, Saru Jayaraman, and David Corn – answer viewer questions after the show. John Brennan served as CIA Director under President Obama and is a Distinguished Scholar at Fordham University and U.T. Austin. He recently wrote for the New York Times about his security clearance being revoked by President Trump, and the Trump administration’s claims of “no collusion” being hogwash. Bill and his roundtable guests - Rick Wilson, Saru Jayaraman, David Corn & Kara Swisher - will answer viewer questions after Friday's show. Bill and his Real Time panelists – Lawrence O'Donnell, Rep. Seth Moulton, D.L. 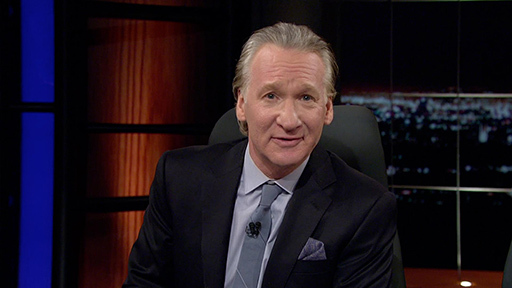 Hughley, Christina Bellantoni, and Steven Pinker – answer viewer questions after the show. 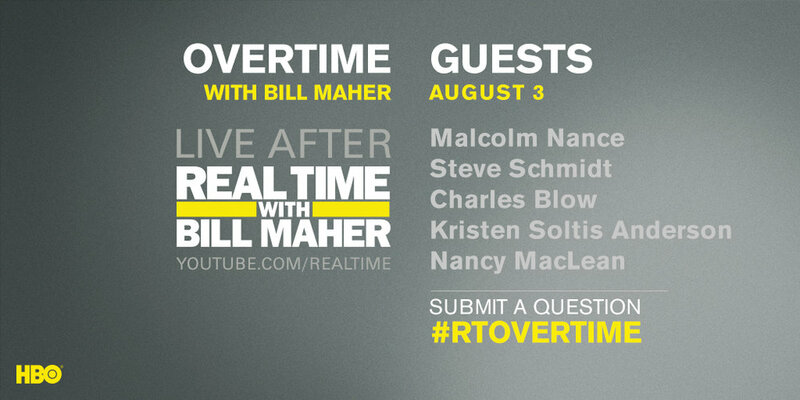 Bill and his Real Time panelists – Malcolm Nance, Steve Schmidt, Charles Blow, Kristen Soltis Anderson, and Nancy MacLean – answer viewer questions after the show. Malcolm Nance is a career U.S. Counterterrorism Intelligence Officer and author of "The Plot to Destroy Democracy: How Putin's Cyberspies are Undermining America and Dismantling the West." Bill and his roundtable guests - Malcolm Nance, Steve Schmidt, Charles Blow, Kristen Soltis Anderson & Nancy MacLean - will answer viewer questions after Friday's show. Bill and his Real Time panelists – Michael Moore, Bradley Whitford, Jennifer Rubin, and Col. Lawrence Wilkerson – answer viewer questions after the show. Bill and his roundtable guests - Ben Shapiro, Bradley Whitford, Lawrence Wilkerson, Jennifer Rubin & Michael Moore - will answer viewer questions after Friday's show. Colion Noir is the host of NRA TV's "Noir" and a reviewer of all things gun. He recently explored “the real story” behind Chicago’s gun violence epidemic. Bill and his roundtable guests - Colion Noir, Michael Pollan, Josh Barro, Michael Smerconish & Neera Tanden - will answer viewer questions after Friday's show. George Will is a NY Times bestselling author and syndicated columnist who recently wrote about President Trump’s negotiations with North Korea over its nuclear arsenal. Bill and his Real Time panelists – Michael Eric Dyson, John Heilemann, Shermichael Singleton, Linda Chavez, and Fareed Zakaria – answer viewer questions after the show.